Artist Edgar Degas (1834-1917) was also born on this day. Read Dancing with Degas by Julie Merberg and Suzanne Bober. In 1692, five women were accused of witchcraft and hung in Salem, Massachusetts. Read The Witch of Blackbird Pond by Elizabeth George Speare. The first Women’s Rights convention in the U.S. was held on this day in 1848, at Seneca Falls, N.Y. The convention was attended by Amelia Bloomer, who wore and advocated for long loose trousers for women, which came to be known as Bloomers. Read You Forgot Your Skirt, Amelia Bloomer by Shana Corey and Chesley McLaren. In 1954 J.R.R. Tolkien’s Lord of the Rings (Book 1) is published. Today for National Rabbit Week, we’ll look at one of our timeless classics. 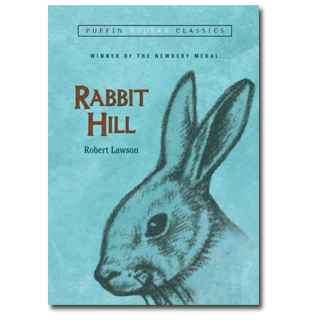 The Newbery winner Rabbit Hill has been much loved from the time it was published in 1944, during the height of World War II, at least in part because it seems very contemporary in its concerns. Robert Lawson was one of those rare creators who could write and illustrate with equal finesse. We have had only a few of these gifted individuals—people like William Steig. They are more rare than rubies. Lawson’s editor May Massee prodded him for some time to write a rabbit story about the house where he lived, “Rabbit Hill,” near Westport, Connecticut. Lawson chose to tell the story from the point of view of the animals who reside on the property. 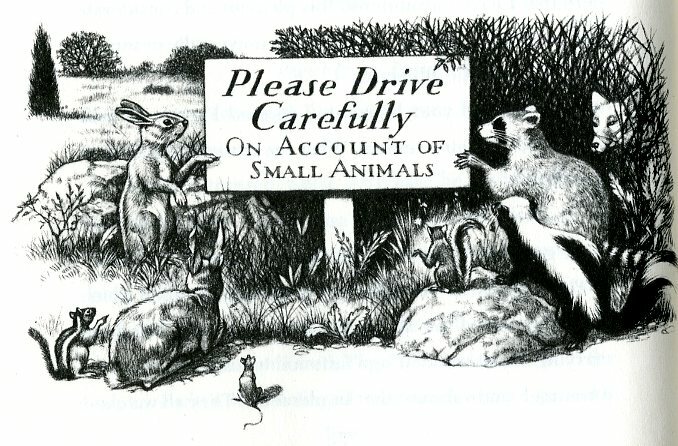 New owners are arriving, and Little Georgie, our rabbit hero, along with a woodchuck, fox, squirrel, fieldmouse, mole, skunk, deer, and other woodland creatures, find themselves both excited about the possibilities and worried about the consequences. In the final chapter, “There Is Enough for All,” Lawson outlines an early message of ecological interdependence. The simple story explores the complex idea of ecological diversity. It emphasizes how people need to share, get along with others, and cooperate. As Lawson wrote about the rabbits on his property, he began to notice them behaving in peculiar ways. In fact, any time good news occurred about the book, a rabbit seemed to herald its arrival. One time a rabbit hopped with him to the mailbox, where he found a letter accepting the book. Later, he saw a rabbit sitting on the lawn, staring at him in the window. It had been months after the publication of the book, and Lawson thought nothing more could be happening to the book. How wrong he was. That day he received a letter congratulating him on the Newbery Award! Lawson had won the Caldecott Medal for his 1941 book, They Were Strong and Good. To this day, he remains the only person to win both the Newbery and Caldecott Medals—an apt tribute for a man whose books have delighted those who read them for more than sixty-five years. The sun had set, and the gold of the west slowly faded to a cool clear green. Venus, hanging low over the Pine Wood, burned brilliantly, all alone at first, but as the sky deepened the smaller stars began to show themselves. High up the new moon swam like a silver sickle. As the dusk thickened the whole Hill began to whisper with the soft rustle of small bodies passing through the grass, with the swish of tiny feet, all making their way toward the garden, for this was Midsummer’s Eve and the Little Animals were gathering. Originally posted July 19, 2011. Updated for . Now we come to a place in mine own heart. There was something so kind and warmhearted about this book, that I decided to use it as a comfort book. One within easy reach on a night stand. If tossing and turning, this is a book that can put me at ease, and it did not surprise me at all that Robert Lawson won both the Newbery and Caldecott medals. After reading his work, it just seems right to me. And that’s not all. The whole story set me to thinking about kindness and sharing and family. It made me think especially of children and my own painful early days. And then, in a small Indiana town, on one very special day, I saw something so moving, it nearly brought me to tears. It was a group of clean cut and well dressed happy farm children, playing with each other, quietly laughing, and all getting along. Lots of sincere smiling and much gentility was evident. They were just absolutely, happy. That scene, one I don’t think I’d ever witnessed before, did something to me. It made me ask myself “Where have all the happy children gone?” And I’m still asking it. How delightfully amazing, one man’s work, Rabbit Hill, can open new pathways for a someone open to creativity. This must be the watching-for-magic moment, Roald Dahl talked about. Rabbit Hill is one of my favorite read alouds of all time. When my son was in third grade, we read Rabbit Hill and its sequel The Tough Winter (http://fruitcakefiles.blogspot.com/2010/12/celebrating-winter-solstice-full-lunar.html). We both enjoyed the stories, the characters–my son excelled at speaking in Uncle Adaldous’s backwoodsy dialect–and the message: there is enough for all. Jude and Gordon: Thank you for your comments. Gordon, that Indiana story is so touching — really the spirit of this amazing book. I think I need to start hanging out with the bunnies in our yard! Yes, Eric, you never know what will happen if you do. Particularly if they start hopping to the mail box. Robert Lawson was one of my favorite authors as a child (along with Robert McCloskey) and they both had a strong influence on my own writing career. I adored Ben and Me, thought it was the most clever idea ever and somehow, I think influenced my Humphrey books. Rabbit Hill is magical and my son loved it, too. Thank you so much for highlighting Lawson. Regarding Gordon’s question about the happy children, I think of my childhood summers when all of the children in our neighborhood played outside all day long. We might take a break in the late afternoon heat, or sometimes go off for a swim, have dinner and convene on the front lawns to play more games and catch lightning bugs. And we were happy. I guess all the children now are at their computers and other screens. I hope they’re happy. They’re definitely not outside. I still have, and reread every few years, the book report I wrote on Rabbit Hill in fifth grade. Of course I’ve reread the book, too. Love it! just requested this. I remember reading this post the first time around and thinking to add it to my list of books to read, but did not follow through. thanks for the almanac, anita, what a treasure to have this come to my “twitter box” every single day. Still on my night table for relaxing. And can be a good companion with Mindfulness Meditation, for us grown kids. I drive by the Rabbit Hill house every Sunday on my way to church. Subsequent owners, the most recent ones, have taken good care of the house and grounds and respect Lawson’s legacy. Thought there have been additions and renovations, the front entrance with its broad stone patio looks just as it did when Robert Lawson’s picture was taken there, squatting beside a stone rabbit statue. That picture appears on biographies and critical works. For ten years (2001-2010) one of the former owners of the house funded the fabulous Rabbit Hill Festival of Literature that was run by the Westport Library. The rabbits are still pleased. Thanks Gordon and Suzi for the comments, and Connie for the update. I am glad to hear the rabbits of Rabbit Hill still have enough for all. And I still read this book at least yearly.